In the early hours of September 2nd, 1666 a fire began at a the bakery of Thomas Farriner, baker to King Charles II. According to most accounts, it is likely that Mr. Farriner failed to put out the fire in his ovens, leading to an ember blowing out and igniting nearby straw. Sparks from the bakehouse showered surrounding buildings, and soon the fire spread to the Star Inn in Fish Street. From there, the fire quickly spread to the north, east and west. 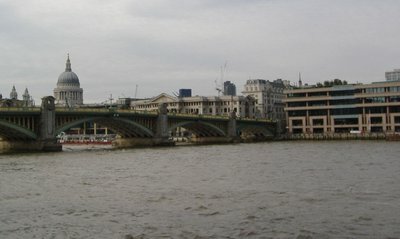 Only the Thames River stopped the fire from spreading to the South. The fire, now known as The Great Fire of London burnt for days. Up to 430 acres were affected by the fire, much of them within the city walls. Over 13,000 houses, 87 parish churches, 6 chapels, 3 city gates, four bridges, 52 guild halls, a prison and many famous and important buildings had been destroyed, leaving ten of thousands homeless and ruined. 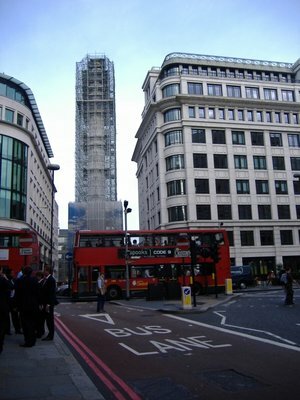 So important an event is The Great Fire in the history of London that they erected a monument to it. Unfortunately, you can't see it right now, because it is covered in scaffolding as part of a refurbishment, but it is there. I won't describe in any more detail the Great Fire, because people much more eloquent than I described the fire in eye witness accounts, including Samuel Pepys. Mr. Pepys was a member of parliament who is now most famous for his diary of his life in London. Mr. Pepys described his view of the multiple days of the fire, which is available online at the European History About pages, taken from The Diary of Samuel Pepys, by Samuel Pepys, transcribed by Mynors Bright and edited by Henry Wheatley, London, 1893. On the 2nd day of the fire, Mr. Pepys was in his boat on the Thames River watching the fire. Eventually the heat, embers and ash blowing across the river was too much for Mr. Pepys. When we could endure no more upon the water; we to a little ale-house on the Bankside, over against the 'Three Cranes, and there staid till it was dark almost, and saw the fire grow; and, as it grew darker, appeared more and more, and in corners and upon steeples, and between churches and houses, as far as we could see up the hill of the City, in a most horrid malicious bloody flame, not like the fine flame of an ordinary fire. Barbary and her husband away before us. We staid till, it being darkish, we saw the fire as only one entire arch of fire from this to the other side the bridge, and in a bow up the hill for an arch of above a mile long: it made me weep to see it. The churches, houses, and all on fire and flaming at once; and a horrid noise the flames made, and the cracking of houses at their ruins. 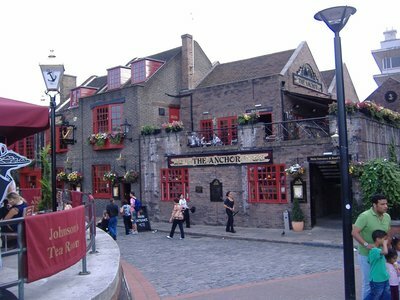 That little ale-house on the Bankside was the Anchor pub, the pub attached to the Anchor Brewery, established in 1616 by James Monger. The Anchor Pub still exists, and so we know that the view that Mr. Pepys would have had across the River Thames would have looked something this, however with different buildings, and most of them on fire. The Anchor Brewery first came to my attention back in the spring of this year, right about the time I had decided to move to the United Kingdom. I had picked up a booked called "Beer: The Story of the Pint; The History of Britain's Most Popular Drink" by Martyn Cornell. The book is a pretty heavy read, starting with the first known brews in ancient Egypt with a lot of scientific crap on how different types of beers are brewed and what the OG (original gravitity) of different types of beer are, so it took me many months to get to the half way point of the book, which in the timeline of the book brought me up to the 1700s and 1800s. The author Mr. Cornell writes about how in the late 1700s a number of Quakers started to get into the brewery business. "Most profession were barred to them because of their beliefs, and an objection to tithes, the tax on farmers imposed by the Church of England, drove them away from agriculture. Once in business their integrity, and their willingness to help each other through difficult times, helped them prosper." He goes on to talk about how by the end of the century (1700) that two of the biggest breweries in London (and probably the world) were run by Quakers, one of those being the Anchor Brewery in Southwark, which "a knot of Quakers" (according to the previous owner's widow) had bought. One of the names, and probably the most famous, would be the name of BARCLAY (yes, of the banking). According to legend, David Barclay, who was a Quaker banker, was walking across a Thames Bridge when he saw a "For Sale" sign on the brewery wall, and decided to buy the brewery so that his nephew Robert would have a career. The tale is probably urban myth as the brewery manager prior to the sale was John Perkins, who was also a Quaker, and as such likely was the one who alerted David Barclay to the sale, especially seeing as he became on the investors and co-owners of the brewery. 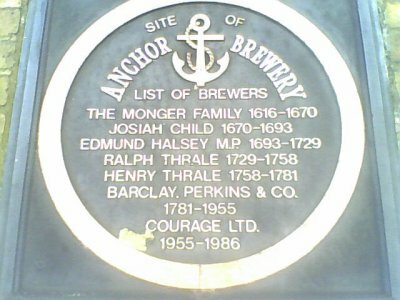 Four Quaker families went in to become partners on the purchase of Anchor Brewery (later renamed the Barclay Perkins Brewery) - Barclay, Perkins, Bevan (partners with Barclay in banking) and (potentially later after the sale) GURNEY. That was the only mention of the name Gurney I found in the book. Gurney is not specifically mentioned in the original sale information about the Anchor Brewery on page 117, but mentioned specifically on page 172, where the book says, "Like other breweries, even the biggest, Barclay Perkinds was a family-run business. Even in 1889 the partners were all descendants of the Barclay, Perkins, Bevan and Gurney familes who were the original investors in the concern in 1781." I couldn't find much on the Internet regarding the Barclay and Gurney connection, save for an article which talks about a bank in Norwich called Gurney and Co joining an amalgamation of 20 banks under the name Barclay & Co. Ltd. in 1896, though this would suggest that the banks merged long after any Gurney was investing with Barclay on a brewery. According to another history of English breweries, the brewery was Barclay and Perkins until 1955, when it merged with Courage breweries. The brewery finally closed in 1981. At that time, the site underwent a redevelopment and the remains of the ancient GLOBE THEATRE (yes, THAT Globe Theatre) were found in 1989, and "and after seven years of campaigning led by Sam Wanamaker, a reconstructed Globe Theatre was opened to the public in August 1996 with a performance of The Two Gentlemen of Verona, the first production held on the site for more than 350 years." 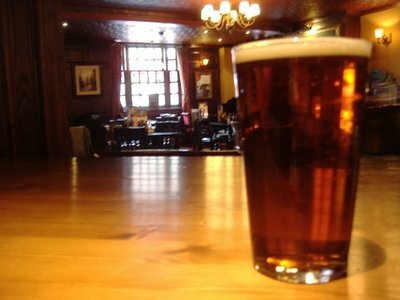 The site of the Brewery is now a Premier Inn, and the pub house itself has undergone a number of extensions and refurbishments over the years, but it still has a nice character, a large patio on to the River Thames and even a few hand pumped ales on tap. Now, many of you (especially those not related to me) will probably wonder why I have done so much research into this brewery and the names of Barclay and Gurney. My grandmother, who was the one whom I claimed ancestry from when first coming to London, had the maiden name Gurney. 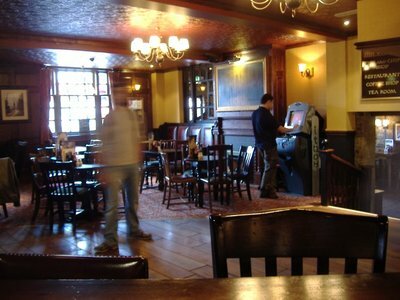 My father, uncle and a cousin have done a lot of research into our genealogy and as far as we know, I have no family connection to the Gurneys who were the bankers and brewers. Too bad for me, and lucky for the folks at Barclays Bank, I think. Otherwise, I probably would have already marched into the Barclays office to collect my inheritance and demand a job. "Hey there, I'm here to see Mr. Varley about my job. I was thinking Vice President. No, no, you're right. That's probably a little too junior for me. Senior Vice President? Nah, probably want to stretch a little bit. Don't want to make a lateral move. Executive Vice President. That seems right. So, will Mr. Varley see me now?" I could do it too. 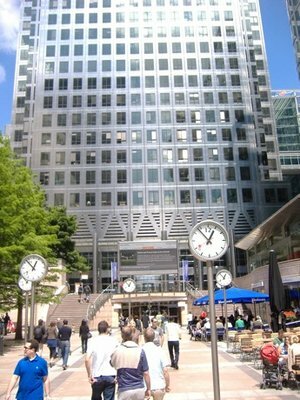 Barclays is headquartered at Canary Wharf. I could walk there in 20 minutes. I wonder what would happen if you actually went in there and asked? Security, or Police?